Special K Casserole is a very easy to make. It’s been around for years. 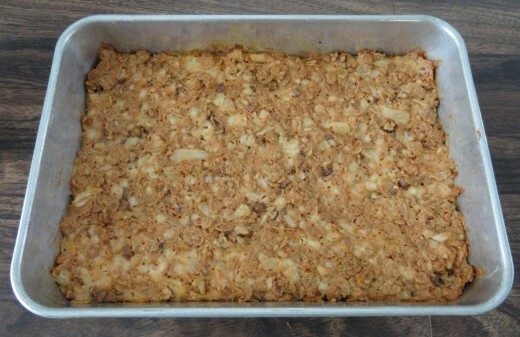 This is a well know vegetarian casserole to those who are Seventh Day Adventists such as myself. I learned to make it from my Mom. We made a lot of vegetarian foods as I was growing up. It is quite simple to make. All you do is sauté the onions and celery then mix the rest of the ingredients together. Put it in a baking pan and pop into the oven for 45 minutes. Take it out and serve it with your favorite veggies or salad. There are different variations of how to make this. My recipe isn’t just a very simple one. You can use other seasonings in this recipe such as sage or thyme. Some make it with milk but use vegan, soy, or rice milks. If you don’t like pecan nuts use walnuts. They are really great in this recipe. It’s a pretty easy recipe to change up as you go along. Saute onion and celery in ¼ cup butter. Spoon into a loaf pan or 9 x 13 pan. Could just be me, but I didn’t see an oven temperature.